Just as Cinderella turned from a poor teenager into a magnificent princess with the aid of a little magic, scientists at the U.S. Department of Energy's Argonne National Laboratory have transformed a common metal into a useful catalyst for a wide class of reactions, a role formerly reserved for expensive precious metals. In a new study, Argonne chemist Max Delferro boosted and analyzed the unprecedented catalytic activity of an element called vanadium for hydrogenation – a reaction that is used for making everything from vegetable oils to petrochemical products to vitamins. "Typically, catalyzing these reactions has typically required precious metals, like platinum, palladium or rhodium," Delferro said. Unfortunately, most vanadium on its own will not work for the hydrogenation process. To make the vanadium work required a three-step process. First, the vanadium has to be in its 3+ oxidation state, a very reactive but unstable state. Second, the vanadium had to be relatively dispersed on the surface – if the clumps of vanadium atoms were too big, they would cease to be as active. Last, the vanadium atoms had to be "low-coordinated", which means that there would be electronic room for the target molecules to bind. 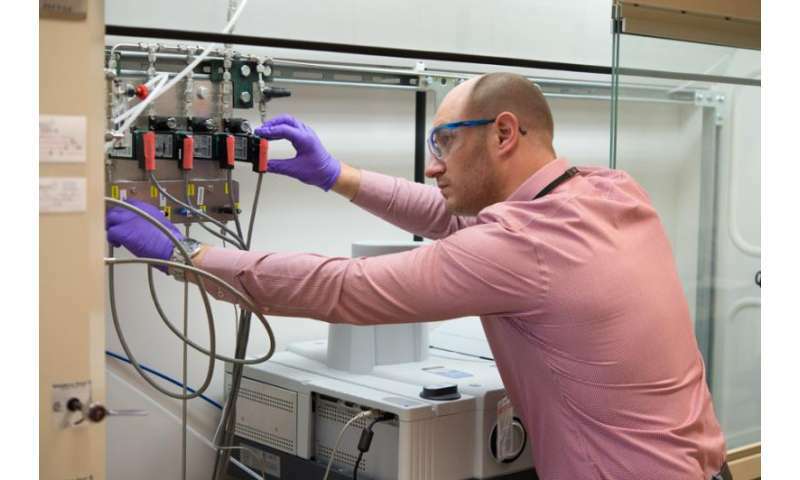 "Getting single-atom vanadium into this special configuration on metal oxide surfaces is not easy," Delferro said. "It requires the use of special synthetic techniques such as surface organometallic chemistry and atomic layer deposition. However, if we can make vanadium or another abundant metal as catalytically active as the noble metals, we can create dramatic cost savings in these very common and commercially important catalytic processes." An article based on the study, "Isolated, Well-Defined Organovanadium(III) on Silica: Single-Site Catalyst for Hydrogenation of Alkenes and Alkynes," appeared online in Chemical Communications on May 9 in the special issue, "ChemComm's 2017 Emerging Investigators."